The Upper Mustang Tiji Festival is a colourful festival held yearly on the full moon day in May. The Upper Mustang Tiji Festival consists of 3 days of Tibetan rituals and dancing dedicated to a deity named DorjeJono who saved the kingdom of Mustang from destruction. It is a deeply religious Tibetan Buddhist festival steeped in ancient tradition. Monks from the many monasteries (gompas) gather and the town square in Lo Manthang fills with characters dressed as demons in flamboyant robes and hideous masks that dance about casting spells. This is a once in a lifetime experience for trekkers and one that not many will see. The unique cultural experience of the Upper Mustang Tiji Festival is a delight to photographers and those looking for a special experience. 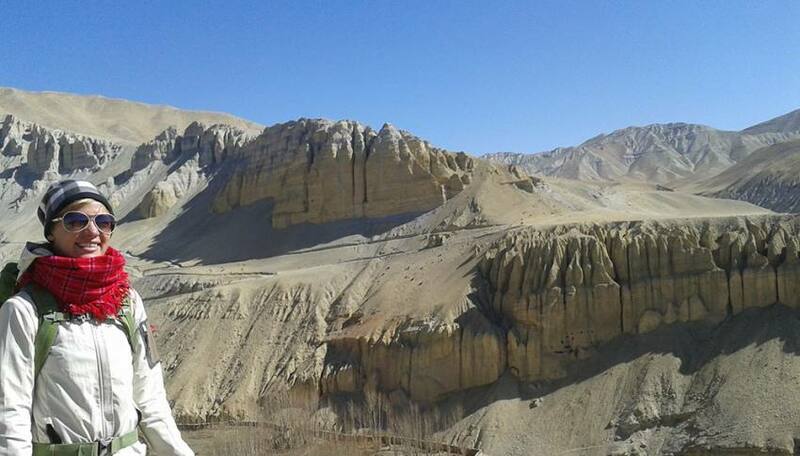 Upper Mustang and it’s walled capital Lo Manthang is a remote and starkly beautiful area. Off limits to tourists until it was opened in 1991 it is still one of the most culturally authentic and isolated regions of Nepal and is still referred to as the Last Forbidden Kingdom. Located in the rain shadow of the Dhaulagiri range on the Tibetan plateau Upper Mustang is one of the most spectacular regions of Nepal. With sculpted canyons, fantastic rock formations, Tibetan style villages, cave complexes, royal palaces, fortresses and Tibetan Buddhist monasteries under the shadow of the snow capped peaks of the Himalayas. Our trek takes us along the Kali Gandakigorge which is the deepest in the world, along the rocky river bed through isolated villages and along stunning high trails with spectacular views. We visit the meditation caves of Guru Rimpoche and the walled city of Lo Manthang the home of the Mustangi king. Home to countless Tibetan Buddhist monasteries and also to the Bon religion which is an ancient religion that predates Buddhism we can learn about the culture and spirituality of the people of the region. This trek is perfect for those that seek a unique cultural experience, want to experience some very different and stunning landscapes or are interested in more isolated and remote locations. Colorful and fascinating Tiji Festival in Lo Manthang. Day 2Kathmandu to Pokharaby road 6-7hrs drive It’s a full day driving today to the beautiful lakeside town of Pokhara. We can enjoy the scenery of villages in the lush hillside landscape along the way. Overnight in Pokhara. Included meals – breakfast. Day 3Pokhara – Jomsom flight – Kagbeni (2810m) 4-5 hrs trek This morning we fly to Jomsom on an early morning mountain flight. This flight is one of the most incredible mountain flights in Nepal. Flying between the 8000m+ peaks of the Annapurna and Dhauligiri mountains through the valley it is truly spectacular. On arrival in Jomsom we are greeted with a panorama of snow capped peaks and an introduction into the stark and rocky landscape of the Mustang region. From Jomsom we trek along the Kali Gandakiriver to Kagbeni. This is a lovely village with a Tibetan culture and monastery we can visit. Overnight in Kagbeni. Included meals – breakfast, lunch, dinner. Day 4Kagbeni to Chele (3050m) 5-6 hrs Today we walk along the Kali Gandakiriver after entering the restricted Upper Mustang area. We start by heading up high on the plateau above the river bed from where we have magnificent views of the surrounding area. After 3 hours we get to the village of Tangbe which is a maze of narrow alleys and white washed houses with fields of buckwheat, barley and apple orchards. 1.5 hours after Tangbe reach Chhuksang, a Tibetan village and as we walk through the Kali Gandaki we can see many ancient caves in the dramatic fluted clifffaces.Overnight in Chele. Included meals – breakfast, lunch, dinner. Day 5Chele to Syanboche (3920m) 5-6 hrs Chele is a beautiful traditional village where we have some lovely views of the surrounding area and peaks above us. After about 2 hours walk we will reach Samar which has a lovely monastery that we can visit. From Samar we take a different track and walk to the Ranchung Cave and also to the Chungsi Cave. These caves at 3425m are meditation caves that were used by Guru Rimpoche, inside are fantastic Buddhist sculptures and chortens and other Buddhist relics. Along the way high up on the ciff faces we can spot the nests of Himalayan Griffins. We arrive in Syanboche which is a small village where we stay overnight. Included meals – breakfast, lunch, dinner. Day 6Syanboche to Dhakmar (3820m) 6hrs As we climb the ridge this morning to Syanboche La we are rewarded with incredible views of the Himalayas and the picturesque village of Ghiling below. Above Ghiling is an old red gompa and ancient meditation caves in the cliffs. From here we trek through the villages of Tamagaon and some small hamlets with a landscape of rounded granite boulders along the way. Our trek continues with a pleasant walk past several chortens before ascending to the Nyi La pass from where another vista opens up for us. Descending into the scenic green valley we soon pass what is the most spectacular and longest mani wall in the region. Ahead of us we can see a cluster of giant ancient chortens under dramatic cliff faces and we soon arrive in Dhakmar, a sprawling village featuring a dramatic red canyon wall containing many ancient cave dwellings. Overnight in Dhakmar. Included meals – breakfast, lunch, dinner. Day 7Dhakmar to Lo Manthang (3810m) via GharGumba 5 hrs Heading off this morning we pass through the green pastureland and climb up through the canyon to the ridge where we can again enjoy incredible views. We soon arrive at GharGumba (Lo Ghekar) which is one of the oldest gompas in Nepal. Belonging to the Nyingmapa tradition it is connected to SamyeGompa in Tibet and has a strong connection to Guru Rimpoche. We can spend some time visiting the gompa before continuing along through nomadic regions to the walled city of Lo Manthang. It’s an exciting moment for us as we get our first view of Lo Manthang, the fabled walled city of Lo. Lo Manthang consists of around 180 houses amongst narrow streets and some of the most incredible Tibetan Buddhist gompas in Nepal. There are 4 major temples within the walls and we can spend some time exploring these and experiencing local life as well. Overnight in Lo Manthang.Included meals – breakfast, lunch, dinner. Day 8Lo ManthangTiji Festival It’s the first day of the Tiji Festival today. This is an annual event in Lo Manthang is the most colorful in the region. It consists of 3 days of Tibetan rituals centered around the celebration of good triumphing over evil. According to myth Tiji tells of a deity named DorjeJono who must battle against his demon father to save the kingdom of Mustang from destruction. During Tiji festival the town square fills with characters dressed as demons in flamboyant robes and hideous masks dancing about, slashing the air with swords and intoning spells over onlookers. Overnight in Lo Manthang. Included meals – breakfast, lunch, dinner. Day 11Lo Manthangto Chrang (3560m) 4-5hrs Our day starts with a short ascent to the Lo La Pass where we can have our last view of the incredible walled city of Lo Manthang. From here it’s easy walking to reach the village of Chrang perched on the edge of a dramatic canyon with it’s green poplars and willows. The village is dominated by the crumbling five storey Tsarang Dzong, a Tibetan style fortified palace and the ochre colored TsarangGompa belonging to the Sakya tradition of Tibetan Buddhism. We can spend some time walking through the maze of narrow streets and exploring the dzong and gompa for the remainder of our day. Overnight in Chrang. Included meals – breakfast, lunch, dinner. Day 12Chrang to Yara (3610m) 5-6 hrs Today we walk along the rocky river bed of the Kali Gandaki before ascending a ridge to reach the lush oasis of Dhi. From here it’s another hours walk along the river valley with a final ascent to reach Yara. Yara is a beautiful village with fantastic sculpted canyons in which are the remains of ancient caves now inaccessible. We can spend some time walking through this lovely village and experiencing the local culture and sights. Overnight in Yara. Included meals – breakfast, lunch, dinner. Day 13Yara visit Luri Gumba & Tashi Kabum This morning we head out to the TashiKabum cave complex which is accessible via a narrow Cliffside trail. This is a newly discovered group of 6 caves that feature fantastic Buddhist paintings and a beautifully painted chorten. As the access to this site is quite difficult and dangerous those less adventurous may opt to miss this visit. From here we continue on to LuriGumba and it’s network of Tibetan Buddhist caves. The main LuriGumba is located near the riverbed and the upper prayer rooms and KabumStupa are on a trail above. A feature here is the polished stucco and intricately detailed Newari style Buddhist frescoes depicting the Kagyupa saints which are estimated to be from the 13th or 14th Century. After spending some time exploring here we return to Yara via Ghara another pretty small village. Overnight in Yara. Included meals – breakfast, lunch, dinner. Day 14Yara to Ghiling (3570m) We will be crossing the Kali Gandaki several times today so have your sandals ready. Starting with a descent to the PuyangKhola we pass through Surkhang before hiking back up to a viewpoint looking over the Kali Gandaki. Soon after we are back on the river bed where we cross over before ascending to the dirt road over the Tsarang La. The descent from the pass takes us to a dramatic set of chortens and the longest mani wall in Mustang. Descending to Ghemi we retrace our steps and ascend the Nyi La pass before descending to Ghiling below. Overnight in Ghiling. Included meals – breakfast, lunch, dinner. Day 15Ghiling to Samar (3605m) via Chungsi Caves Leaving Ghiling this morning we climb gradually to the Syangboche La where we can enjoy the views of the Himalayas to the south. Once reaching Syangboche we veer off the trail and descend to the valley past shepherds herding their flocks of sheep and goats. Along the way to the caves we can see the nests of Himalayan Griffins high up in the cliff faces. The Chungsi cave is one of Guru Rimpoche’s meditation caves and up a series of rock steps we can see many Tibetan Buddhist sculptures, chortens and other relics. On leaving the cave it’s a spectacular walk to the village of Samar climbing high into an incredible canyon and enjoying fantastic views along the way. Overnight in Samar. Included meals – breakfast, lunch, dinner. Day 16Samar to Chhuksang (2950m) then drive to Jomsom It’s an easy walk on our last day today with a couple of hours of trekking to reach Chhuksang. From here we will be picked up by our vehicle and make our way to Jomsom by road. Overnight in Jomsom. Included meals – breakfast, lunch, dinner. Day 17Jomsom flight to Pokhara (25 min flight) This morning we have a short early morning flight to Pokhara. This is arguably the most beautiful mountain flight in Nepal as we head down the valley passing in between the sheer massif’s of Annapurna I (8091m) and Mt Dhaulaghiri (8167m). We should be in Pokhara fairly early and we can enjoy a full day of sightseeing here to finish our trip. Pokhara is a beautiful lakeside town picturesquely located on the banks of Phewa Lake. Particularly beautiful is the area beside the lake with the colorful boats that are abundant here. We can enjoy a boat ride on the lake, some souvenir shopping or just relaxing at one of the many bars and café’s n the area. Overnight in Pokhara. Included meals – breakfast. Day 18Pokhara to Kathmandu by vehicle – 5-6 hrs drive We drive back to Kathmandu today. It’s a fairly easy drive and we can sit back and enjoy the scenery. We arrive back in Kathmandu by mid afternoon when you have time for some shopping or to just relax in your hotel. Overnight in Kathmandu. Included meals – breakfast.